Cheesecloth is used to strain everything from homemade cheese to jelly and broth. It’s also used to create little pouches of herbs for seasoning meats, soups, and other dishes. If you don't have any on hand, or you just plain can't stand the stuff, there are plenty of other things that you can use instead. Here are some things to try. Use a flour sack towel, pillowcase, bandana, scrap of fabric, clean cloth diaper, cloth napkin, or a jelly bag to strain foods or contain little bundles of herbs. Choose something you don't care about because the food you're straining can stain the fabric permanently. Be sure to pour liquids through the fabric slowly so they have time to work their way through the fabric. Use a rubber band to secure the fabric over a bowl so it’s held taut while you pour. Toss your fabric in the wash when you’re done. Use a laundry bag, nut milk bag (used for making almond milk), mesh bag (used for making alcohol), or a paint strainer bag (your hardware store should stock them) to strain broths, cheeses, yogurts, and other foods. While you’re no more likely to have milk bags or mesh bags on hand, many people find them worth buying for the simple reason that they’re much easier to clean than cheesecloth and last a lot longer. 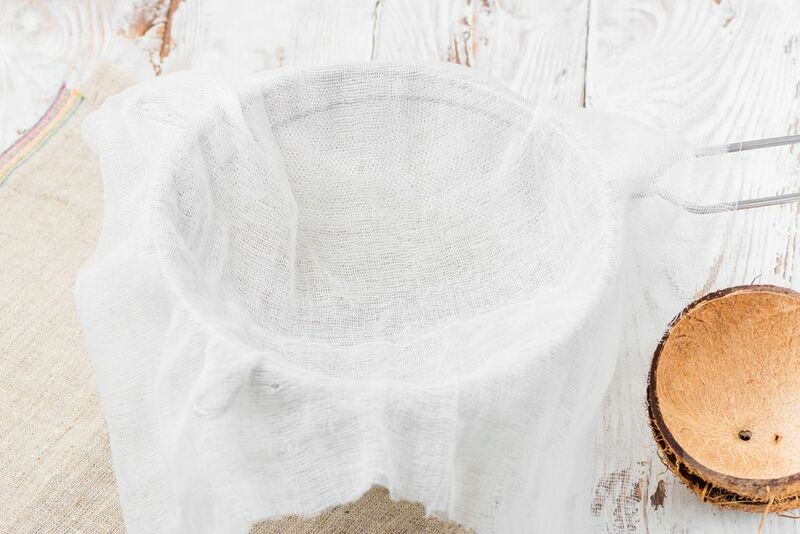 If you’ve ever worked with cheesecloth before, you know just how quickly it wears out, and what a pain it can be to clean. A fine wire sieve is often more than adequate for straining things like broths and cheeses. It won’t catch quite as many of the fine particles as cheesecloth, so it's less suited to straining jelly. If perfectly clear, seed-free jelly is important to you, this won't please you. You should use something else. Stretch a clean pair of pantyhose or tights over a large mixing bowl, and you have the perfect strainer. Need a way to contain some spices? Cut off one of the feet, stick your herbs inside, and tie it shut. Viola! Instant pouch. You can even reuse your little pantyhose pouch again and again. Just toss the pantyhose in the wash when you're done with them and tuck them in a kitchen drawer for next time. You can use a disposable coffee filter or a reusable one; either will work. Since the weave of the mesh is pretty tight (it has to be to keep the grounds out of your coffee), you’ll find it does a beautiful job of straining other foods. Try a kitchen store or order it online. You may even be able to find it at the grocery store.